So forms are essential for trade and government from a communicational but also organisational point of view. In the past, forms helped develop industry but, as a consequence of this, they contributed to enhance and enlarge (the abhorred) bureaucracy. Many examples of rather new forms can be seen in Schwesinger’s book. In addition, in his chapter about the history of forms it possible to find some interesting old examples, but I would like to complement this section with two cases related to passports reviewed in one of the typographic delight class about forms. At least for me, it was is hard to imagine the passports before being the comfortable small booklets they are nowadays. Well, the picture below shows a extended passport from 1820 app (from Italy?). As seen, the communication is based on hand-written information and official stamps. The information carried is similar to the modern passports whereas the object itself is completely different. Instead of a bound book, the old passport has pages folded like an accordion. 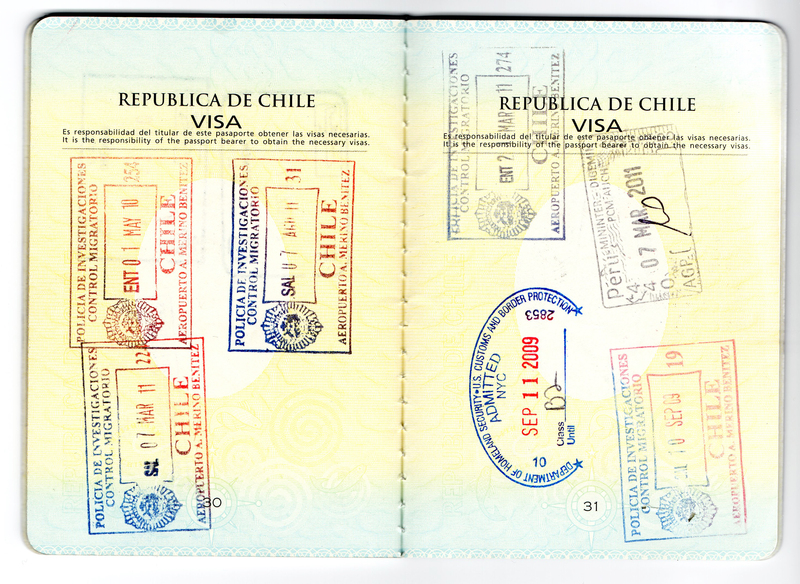 The length of the passport varies according to the amount of travels that the person or family did. The paper was written in both sides until there was no more space to use. Then they added more paper and continue using the same passport for many years. The role of the stamps, on the other hand, is not anymore just an official signature. Stamps now carry most of was used to be written information, such as date, country, city and accrediting bodies. 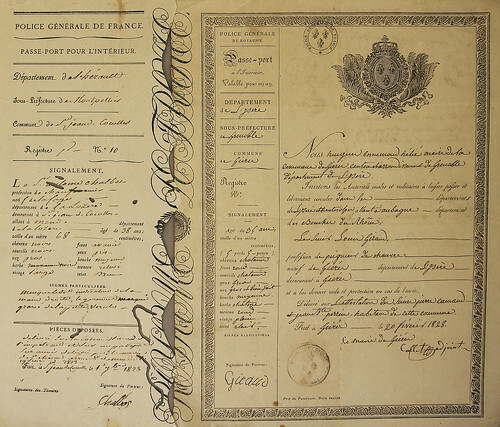 The other remarcable example is a much more sophisticated form, a passport or visa document from France in 1823 and 1828. This document consist in two parts which have the same information in it. One is meant to be for the general police of France and the other (smaller version) is for the person staying in the country. Between the two versions of the visa, there is a vertical text saying “Royaume de France”. 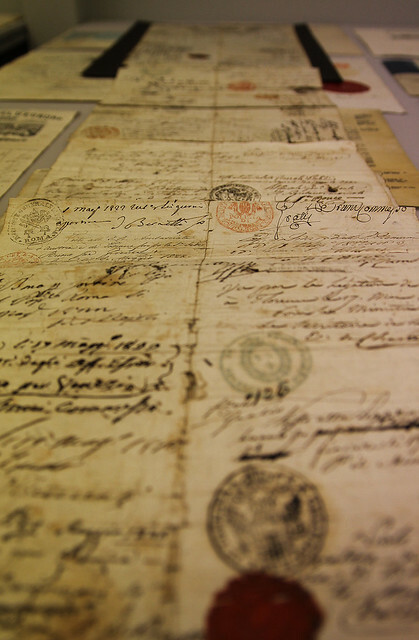 This text is not ornamentation but a way of proving that a document is original. The two parts of the document are cut just over this text, as a way of having a unique way of fitting. In the picture above, the pieces are not from the same document, that’s why they don’t match. The typographic delight of this week was about the emergence of non-latin scripts. Why was it necessary to have non-latin fonts in the first place? Mainly because of the imperialism of the time (15..) and the need to understand the classical sources. 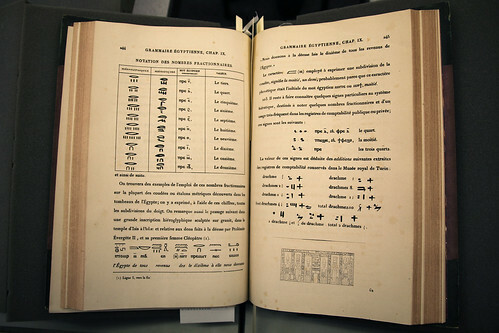 Books started to combine latin and greek scripts as the picture below shows. After the start of use of non-latin scripts in the first books, comes a string of attemps to collect as many symbols from other scripts as possible, with the aim of organising them in a (not always) logical way. 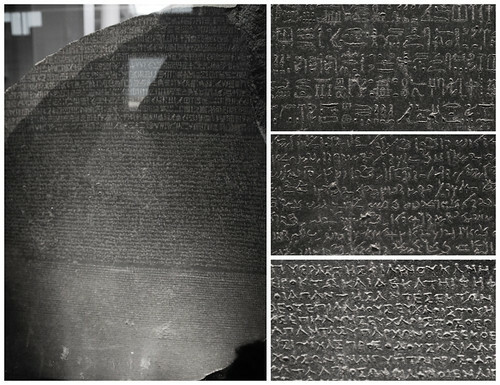 After Rosetta stone was found and after many years of analysis, the book Grammaire Égyptienne by J. F. Champollion was published. As the full title says, this book explains the general principles of the Egyptian sacred writing applied to the presentation of the spoken language. A wierd fact about this book is that it has different style of printing in the first two thirds of the book than in the last one. This is visible in the facing pages below. 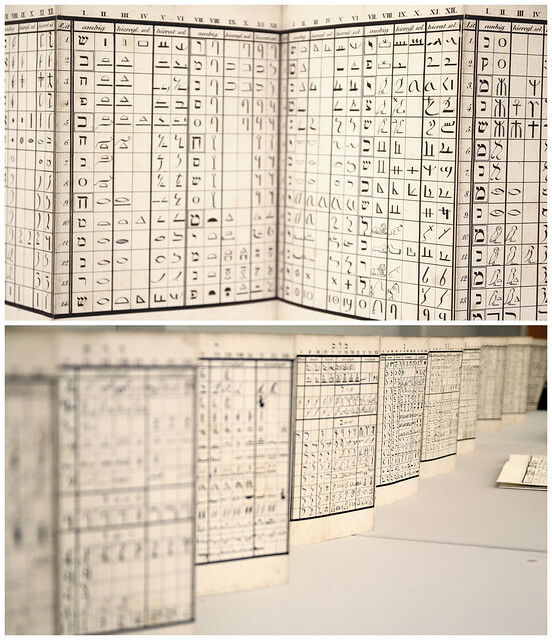 They began the book using lithography and finished it with letterpress combined with lithography (only for special characters).